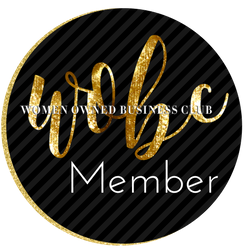 There are days when I’m sure you’re wondering “What have I gotten myself into?” or maybe you’re wondering if all the hassles of dealing with your spouse’s kids, the exes, and fighting your way into being accepted is just too much to handle. 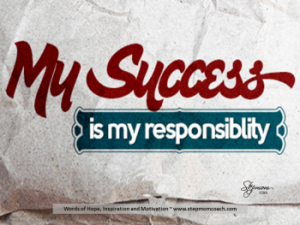 Successful and happy stepmoms practice several habits that make being a bonus mom rewarding and fulfilling. Although they may seem simple, don’t be fooled. You will be amazed by the impact these habits will have on you as well as on others. Patience. It takes time to create trust where trust was broken. Kids believe that mom and dad will be there for them for an eternity. When the family breaks down, that trust and belief is broken, making kids wonder whom to trust. Know/understand your role. Studies repeatedly show that the women who know and understand what their role is in stepfamilies are the happiest. This builds resilience for when more challenging days come crashing in. Have a game plan. If you have no vision, how do you know you are doing well? How do you measure if you are making progress? How do you determine you’re on the right path? It’s like driving a car with blinders on while having your kids in the back seat. Would you dare do that with your children? Have a plan. Be happy with who you are as an individual. One of the best gifts you can give others is to take care of yourself. Love starts from within and then flows out, not the other way around. Think of the oxygen mask instructions when you take the airplane. “You must first put the mask on you, THEN help younger ones.” If you’re depleted, how do you expect to be of use to anyone else? Be a positive role model. We constantly look for people to emulate. That’s probably why so many people enjoy watching TV shows or reading certain magazines. Who is the next big star? How about you? Don’t you think your kids deserve to have someone to look up to? Wouldn’t it be great if that person is you? Children will imitate those with whom they feel a close tie. Make it you. Practicing these five simple steps requires you to make them a priority in your life and your relationships. Marriage and family are created and maintained. They don’t just materialize out of nothing. Write down something you can do for each of these steps and commit to them on a daily basis. You’ll be on your way to having a more satisfying and fulfilled life and stepmom relationships. 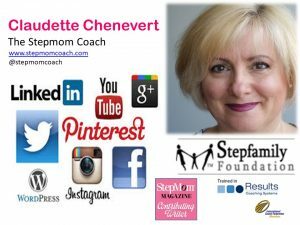 Need additional help and support in knowing how to be a happier stepmom? 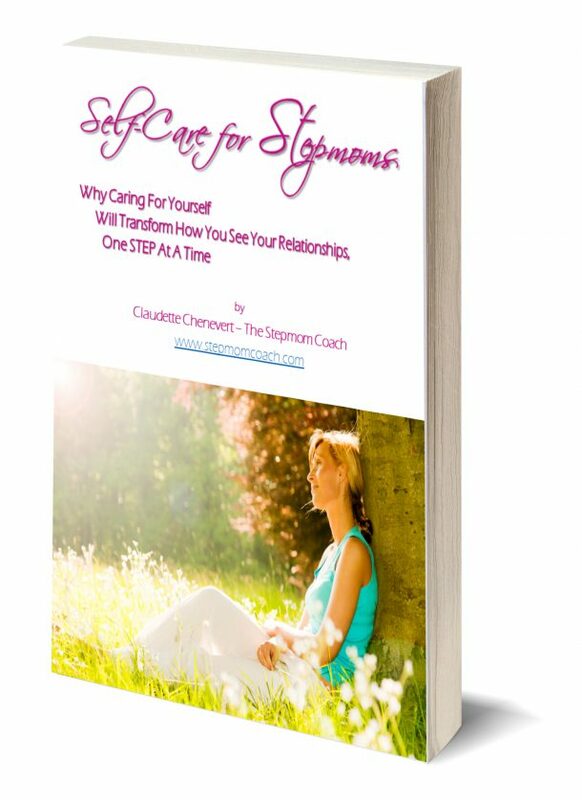 Download my free ebook on Self-Care for Stepmoms. Just fill in your name and best email address and I’ll send it right over. Stepmoms are outside of my experience, Claudette. I liken it to being the odd-man-out when it comes to a new job. Everyone else has their roles and function and here comes the new interloper. I see your tips just as applicable. Your point about having a game plan I think is critical. Most of us jump into things thinking we can handle it when coming in was a game plan can make a big difference. This is a helpful article. I am not a stepmom (shied away from that challenge a few times) but this is common sense advice. I’ve seen too many stepmoms having a hard way to go. Many stepmoms have shared with me that “If I had known then what I know now, I wouldn’t have gotten involved with a man with children.” Today’s professional/career woman is more likely to meet a man who has children than before. Understanding the responsibilities and challenges BEFORE you become a stepmom can save you a lot of heartache. Having said this, there is no way of avoiding some of the challenges they face. That’s why having support makes a big difference in how you deal with stepfamily obstacles. Good tips! I was raised by a step parents and became one at 19. It was hard for everyone until it wasn’t. Could of used these tips back then. 19??!?!?!? WOW! I’ve heard of large stepfamilies but 19? That must of been very crowded let alone little to no privacy. My mother is the youngest of 16 children (my grandmother would of had 20, maybe 22 according to an aunt, if all her babies had been term). Thanks for sharing Teresa. I’m sure you have plenty of interesting stories to share. I really appreciate your article, Claudette, and I believe these are all habits for building solid relationships of all kinds. As a mom and someone who was married to a man with no kids, I struggled with #2. He didn’t know or appreciate his place. We would agree on how to handle situations and he would do the opposite. It was a strain on his relationships with my kids. He’s now a “wusband” and my kids are grown. Tandy, so many struggle with #2 : Know/understand your role, whether it’s a stepmom or stepdad. Often times, a stepparent either sees their role as either to “replace a parent” or to ” sit on the sidelines.” One of the reasons relationships where kids from a previous are involved that fail is because the marriage wasn’t a priority, where the couple work as a team. Really sad that he is now a “wusband.” Just know that even with adult children, there can still be issues when it comes to bringing a partner in your life. I’m currently working with a stepmom dealing with adult stepkids who don’t address her when they meet at family meetings. Really hard at any point if you don’t have a family vision. Love this. I have a friend who is a stepmom. When she was still getting into the role I remember she hated the ex wife situation. I am sure she has practiced some of your secrets. I do not hear her complain anymore. She has a good relationship with her in laws, step child and significant other. I am sure it is not an easy place to be. Lorii, being a stepmom is one of the hardest jobs in that there are very few positive role models for women to understand what’s the best way to parent a stepchild. What I’ve seen through my work and research is to give first priority to the marriage and first responsibility to the children. I’m glad to hear your friend is doing well. Thanks for sharing. Although I am not a mom, I think these are valuable habits for everyone to have and incorporate into their lives. #4 can be challenging at times for me, so I appreciate your analogy to the air mask. Brilliant! I’ll think of it that way moving forward, thank you! Megan, I know you’re not alone when it comes self-care. We are all guilty of neglecting ourselves in order to help others. What is most important is to become aware that we’re neglecting ourselves and to put in place an action plan to turn this around. Awareness is the first step into changing anything in our lives. Let me know how you’re doing with your self-care regime. Good luck. Great list. Knowing your place doesn’t sound so great, but it’s very important for stepmoms. I think the best thing you can do as a stepmom is to set a good example. Nice post! Thanks Cathy. There are many challenges to being a stepmom, one of them having an ex feel threatened by sharing the role of parent with another woman, or having teens not wanting “another parent figure” in their lives. When you understand what’s expected of you, know where you can be most supportive and useful, this provides guide posts for stepmoms. Positive role models are sometimes hard to find for stepmoms. It’s a challenging position to be in. Thanks for sharing your thoughts. Claudette this message is simple and so important. Women can become overwhelmed by the complexity of the blended family. Many of my clients have shared problems with being a step-mom. They seem to do better when they educate themselves about the role and spend time in self-care. Triangulation can happen and becoming clear with your spouse on how to become united in decisions is helpful! Great blog! Thank you Candess for sharing what you see with your clients around understand roles and the importance of creating a united front with the stepchildren and other extended family members. So many stepmoms try to fit into a mold that doesn’t fit out modern day families. We need to redefine what family is and what it looks like today. Thank you Reba. As much as we think we know what we’re getting into when we merge families together to create a new one, there are often potential emotional storms around the corner. It does get better with practice and years under our belt. What a beautiful post. So many women find themselves in this position, most often woefully unprepared for the potential emotional storms around the corner. Your advice is spot on.